Paul and I opened up the house today in the Pines. Other than a couple of large tree branches which came down during some serious winter storms, the place was in pretty good shape. We’ve spent the day doing a lot of clean up projects, but the fact that I’m blogging again after a two month hiatus is testament to the fact that it’s pretty relaxing out here. It’s also a bit of a dump out here at the moment, mostly because lots o’ change is in the air after a power trio plunked down $17 million to buy the majority of the commercial district. Make no mistake that Paul and I could just as easily have done that. That is, if we were powerful, and if we had $17 million. The previously dysfunctional high tea space has been opened up into one big room (buh bye and RIP “Glo Lounge”), and supposedly will be opened up even further to have a balcony+stairs going down to the Pavillion space. Target open date: not sure. The current liquor store will be moving to where the old hardware store was (North side of the Pantry) at the end of the season. Unclear what will happen to the current liquor store space after that move. 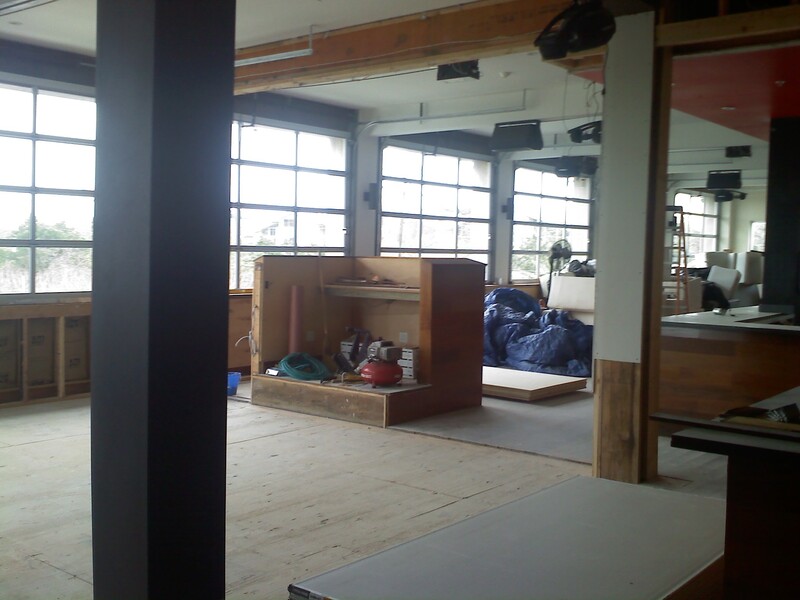 The gym will be put behind the Botel (sorry, Hotel Ciel). The Botel will still be…The Botel. Index (the retail store in The Botel adjacent to Blue Whale) will still be a store, but with some sort of fancy brand or owner that I was too wet (or indifferent) to remember. I’m sure there was more, but Paul and I are soaked at this point, and poor little Nanu is starting to shiver. Plus, our Sloppy Joe ingredients are getting water logged. So that’s all I have for now. Some pics below chronicle the big changes. Doesn’t this look like an incredible paradise? Update: I just received a press release from Steel Gym in the city saying that they will be co-operating the gym in the Pines. Inside of the old Blue Whale. "Book me a table for 9!" 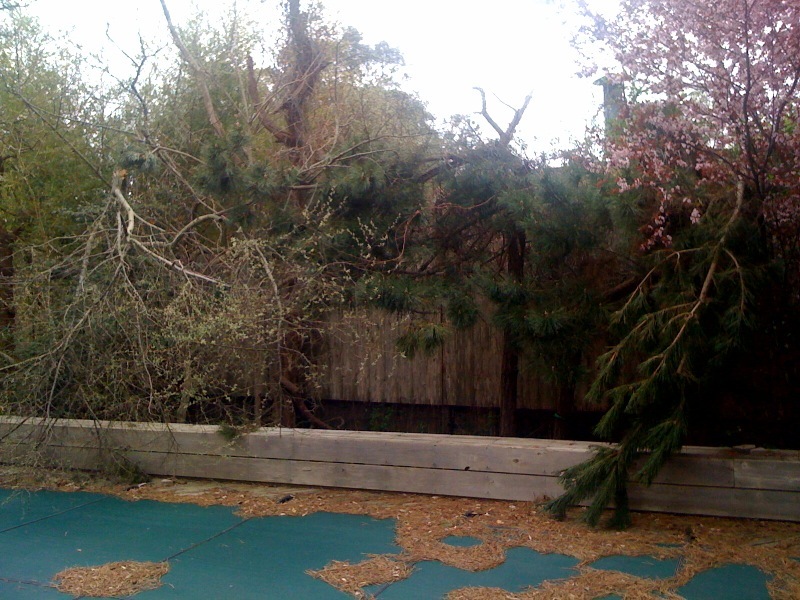 What the storms did to our trees. We spent the day cutting these branches into itty, bitty pieces that fit into garbage bags. Meh. 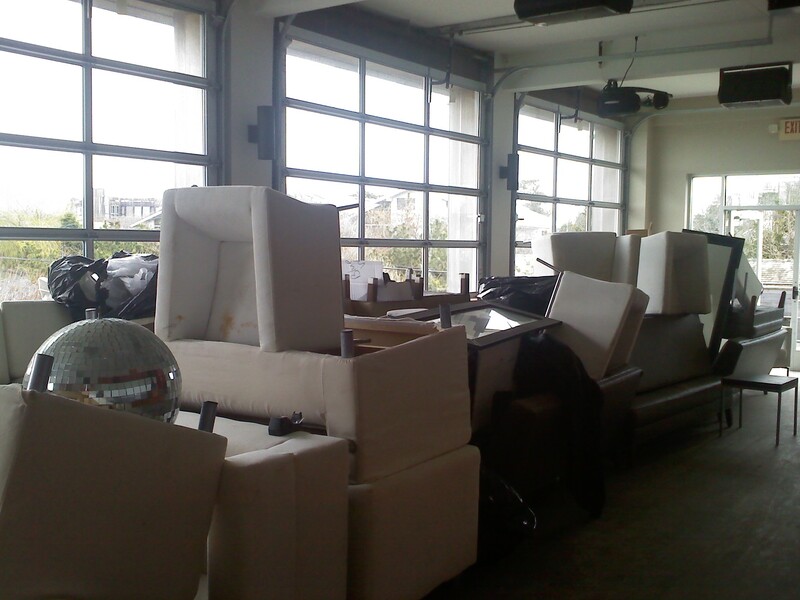 The new owners tore down that stupid wall separating the two areas of the top of high tea. Everything is currently a Big ol' Mess. Hopefully it will turn out great. The High Tea furniture stacked together in a really sad way, including a lonely disco ball. This is random: some of the couches are IKEA SLEEPER beds. Bizarre. 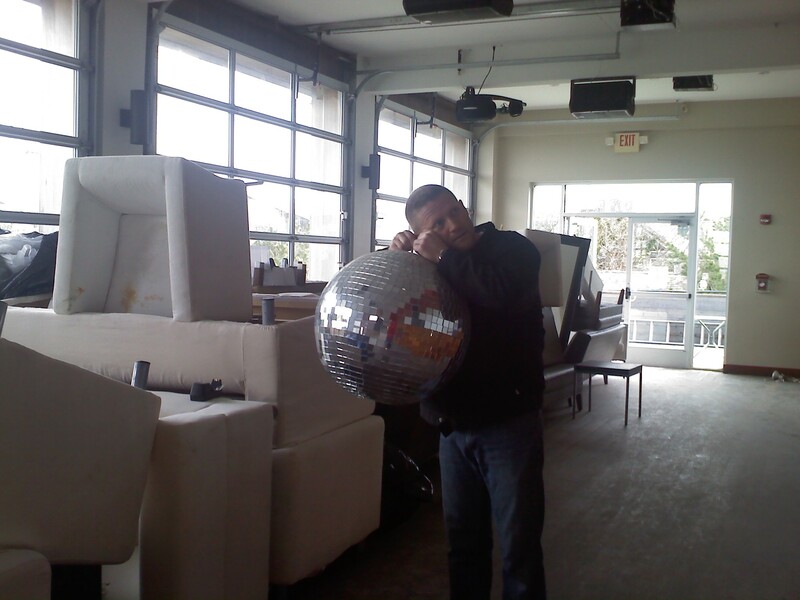 I wondered if the lonely disco ball might make a good earring. But alas, it was kinda heavy. Plus, DOH! My ears aren't actually pierced. "Save me that primo seat!" 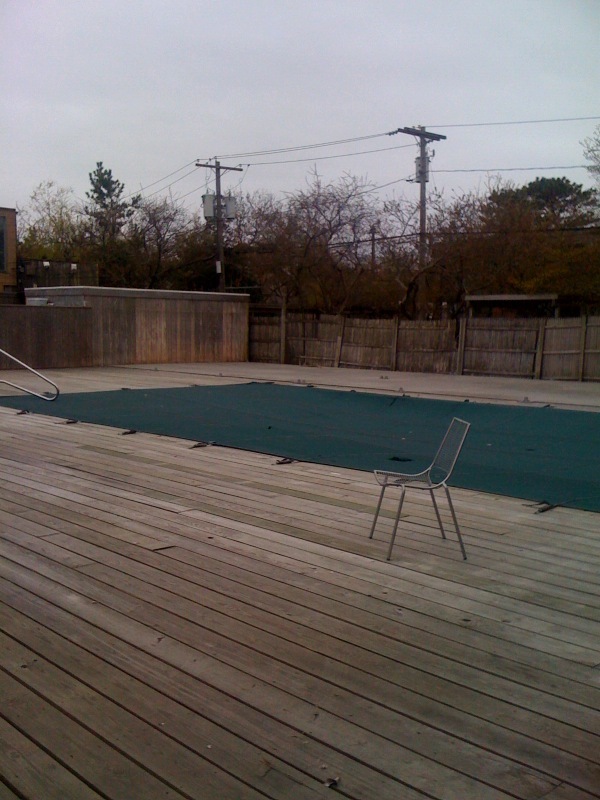 The pool before its transformation into part bar/restaurant blending into the new harbor space. This entry was posted in Uncategorized and tagged fip, fire island, fire island pines. Bookmark the permalink. With you on the Sloppy Joe’s…it’s heaven in a skillet (and on a soggy white bread hamburg bun). Most of the pics are in the commercial district of Fire Island Pines. It was recently purchased by a new investment group. We just documented some of the work being done, but for better or worse, we are not direct investors. 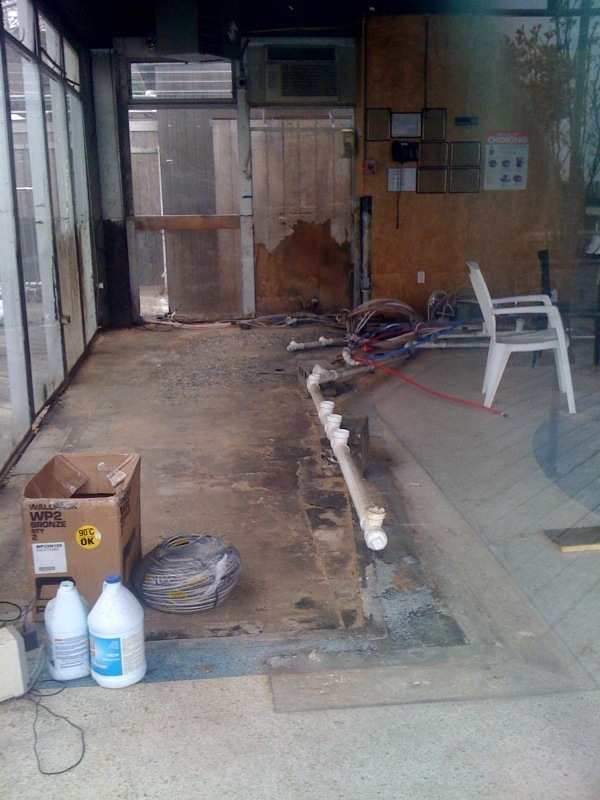 So much for the beloved “fudgie the whale” terrazzo floor at the blue whale. Does this mean no more “low tea”? 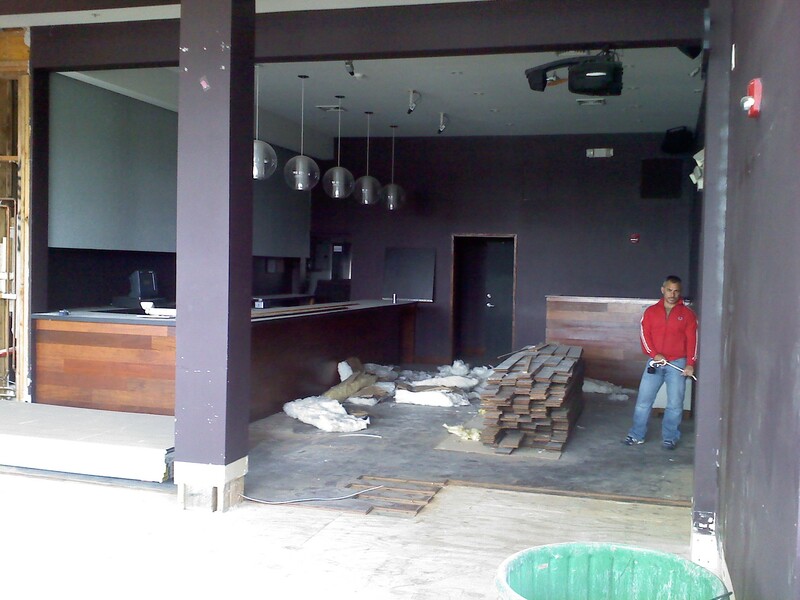 We’re looking forward to visiting in June and seeing all the changes! 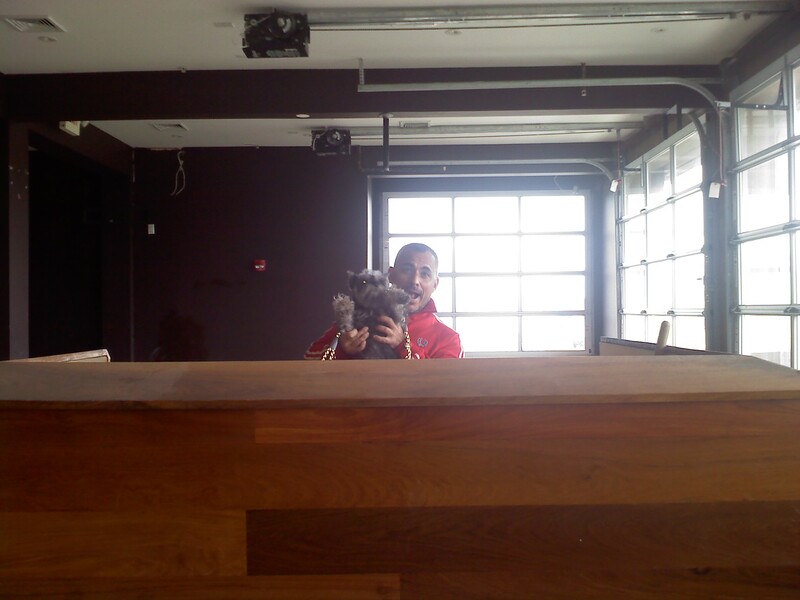 It was nice to see Nanu (and Paul) in the pictures. Not counting on the renovations timing. on June 12th. Kelly Ford eating sloppy joes-NEVER! Love this stuff! Not sure if you had seen this article a while back from Philly (no, it is not a Philly Steak Melt recipe to go with the Sloppy Joe’s.) It thoroughly details the harbor lipstick makeover. Like I say, “a change off color is a good thing.” I am still unclear on the whole Low Tea location, but what we heard was it is the reno is all about “flow” – traffic and revenue. Low Tea will spill out around the pool area and another bar will be set up for blender drinks thereby easing up the long lines at the traditional bars (it used to be that way before you were born :-). Canteen, with its indoor seating for sixty and outdoor seating for 36 will spill out bay and pool side. These flow changes with easy access from the Pavilion to High Tea and the Pool will all make for liquor pit stops. What I loved in the article was that 9000 sq. 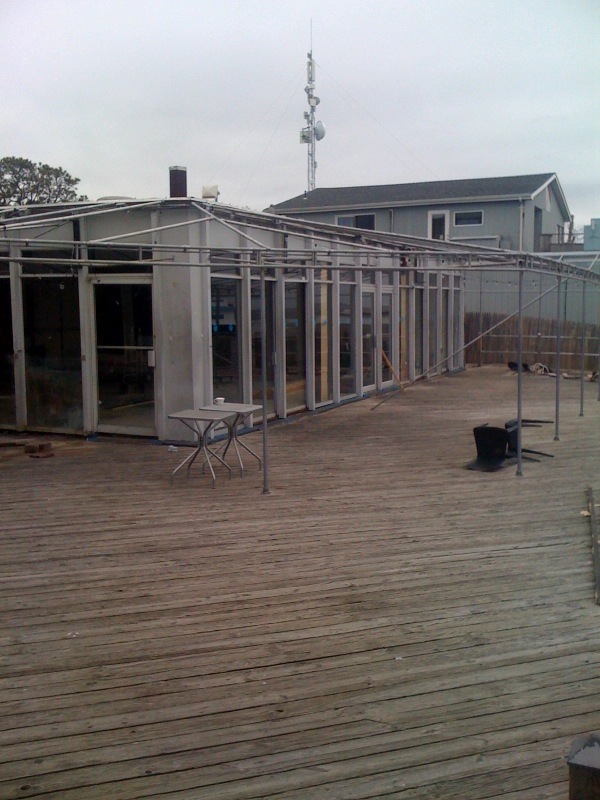 ft of deck/pool area was only used for the gym and the Botel’s laundry…ugh. Glad the reno isn’t going on in Arizona – or it wouldn’t be happening!